Chelsea have reportedly decided to part ways with Eden Hazard at the end of the season regardless of the outcome of their appeal for the transfer ban. The Blues are currently suspended from making signings for two transfer windows after breaking rules pertaining the handling of under-age players. For this, they have already acted by making an initial appeal to FIFA but this has, however, not frozen the embargo levied upon them by the governing body. 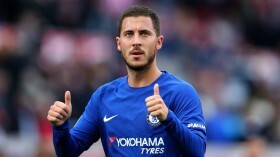 According to AS, the Blues will look to sell Hazard before the beginning of next season as they are unlikely to risk the prospect of losing him on a free in June 2020. The publication adds that the club could accept a fee of around £98m for the Belgian and the deal would go through irrespective of the ongoing transfer ban. Real Madrid are currently the outright favourites to sign the attacker with Hazard said to hold a huge admiration for the club and manager Zinedine Zidane.